For a long time, medieval medicine has been dismissed as irrelevant. This time period is popularly referred to as the “Dark Ages,” which erroneously suggests that it was unenlightened by science or reason. However, some medievalists and scientists are now looking back to history for clues to inform the search for new antibiotics. The evolution of antibiotic-resistant microbes means that it is always necessary to find new drugs to battle microbes that are no longer treatable with current antibiotics. But progress in finding new antibiotics is slow. The drug discovery pipeline is currently stalled. An estimated 700,000 people around the world die annually from drug-resistant infections. If the situation does not change, it is estimated that such infections will kill 10 million people per year by 2050. I am part of the Ancientbiotics team, a group of medievalists, microbiologists, medicinal chemists, parasitologists, pharmacists and data scientists from multiple universities and countries. We believe that answers to the antibiotic crisis could be found in medical history. With the aid of modern technologies, we hope to unravel how premodern physicians treated infection and whether their cures really worked. To that end, we are compiling a database of medieval medical recipes. By revealing patterns in medieval medical practice, our database could inform future laboratory research into the materials used to treat infection in the past. To our knowledge, this is the first attempt to create a medieval medicines database in this manner and for this purpose. 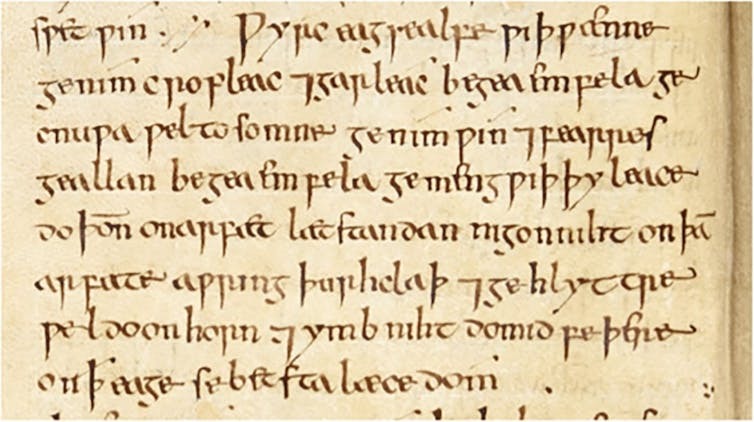 In 2015, our team published a pilot study on a 1,000-year old recipe called Bald’s eye salve from “Bald’s Leechbook,” an Old English medical text. The eye salve was to be used against a “wen,” which may be translated as a sty, or an infection of the eyelash follicle. A common cause of modern styes is the bacterium Staphylococcus aureus. Methicillin-resistant Staphylococcus aureus (or MRSA) is resistant to many current antibiotics. Staph and MRSA infections are responsible for a variety of severe and chronic infections, including wound infections, sepsis, and pneumonia. Bald’s eye salve contains wine, garlic, an Allium species (such as leek or onion) and oxgall. The recipe states that, after the ingredients have been mixed together, they must stand in a brass vessel for nine nights before use. In our study, this recipe turned out to be a potent antistaphylococcal agent, which repeatedly killed established S. aureus biofilms—a sticky matrix of bacteria adhered to a surface—in an in vitro infection model. It also killed MRSA in mouse chronic wound models. Premodern European medicine has been poorly studied for its clinical potential, compared with traditional pharmacopeias of other parts of the world. Our research also raises questions about medieval medical practitioners. Today, the word “medieval” is used as a derogatory term, indicating cruel behavior, ignorance, or backwards thinking. This perpetuates the myth that the period is unworthy of study. During our eye salve study, chemist Tu Youyou was awarded the Nobel Prize in Physiology or Medicine for her discovery of a new therapy for malaria after searching over 2,000 recipes from ancient Chinese literature on herbal medicine. Is another “silver bullet” for microbial infection hidden within medieval European medical literature? Certainly, there are medieval superstitions and treatments that we would not replicate today, such as purging a patient’s body of pathogenic humors. However, our work suggests that there could be a methodology behind the medicines of medieval practitioners, informed by a long tradition of observation and experimentation. One key finding was that following the steps exactly as specified by the Bald’s eye salve recipe—including waiting nine days before use—was crucial for its efficacy. Are the results of this medieval recipe representative of others that treat infection? Were practitioners selecting and combining materials following some “scientific” methodology for producing biologically active cocktails? The “Lylye of Medicynes” is a 15th-century Middle English translation of the Latin “Lilium medicinae,” first completed in 1305. It is a translation of the major work of a significant medieval physician, Bernard of Gordon. His “Lilium medicinae” was translated and printed continuously over many centuries, until at least the late 17th century. The text contains a wealth of medical recipes. In the Middle English translation, there are 360 recipes—clearly indicated with Rx in the text—and many thousands more ingredient names. As a doctoral student, I prepared the first-ever edition of the “Lylye of Medicynes” and compared the recipes against four extant Latin copies of the “Lilium medicinae.” This involved faithfully copying the Middle English text from the medieval manuscript, then editing that text for a modern reader, such as adding modern punctuation and correcting scribal errors. The “Lylye of Medicynes” is 245 folios, which equates to 600 pages of word processed text. I loaded the Middle English names of ingredients into a database, along with translations into modern equivalents, juxtaposed with relationships to recipe and disease. It is very time-consuming to format medieval data for processing with modern technologies. It also takes time to translate medieval medical ingredients into modern equivalents, due in part to multiple synonyms as well as variations in modern scientific nomenclature for plants. This information has to be verified across many sources. With our database, we aim to find combinations of ingredients that occur repeatedly and are specifically used to treat infectious diseases. To achieve this, we are employing some common tools of data science, such as network analysis, a mathematical method to examine the relationships between entries. Our team will then examine how these patterns may help us to use medieval texts as inspiration for lab tests of candidate “ancientbiotic” recipes. In March, we tested a small portion of the database to ensure that the method we developed was appropriate for this data set. At present, the database contains only the 360 recipes indicated with Rx. Now that the proof-of-concept stage is complete, I will expand the database to contain other ingredients which are clearly in recipe format, but may not be marked with Rx. We are specifically interested in recipes associated with recognizable signs of infection. With Bald’s eye salve, the combination of ingredients proved to be crucial. By examining the strength of ingredient relationships, we hope to find out whether medieval medical recipes are driven by certain combinations of antimicrobial ingredients. The database could direct us to new recipes to test in the lab in our search for novel antibiotics, as well as inform new research into the antimicrobial agents contained in these ingredients on the molecular level. It could also deepen our understanding of how medieval practitioners “designed” recipes. Our research is in the beginning stages, but it holds exciting potential for the future.